I was with some friends breakdancing the other night. At one point, a more experienced dancer was showing me what I was doing wrong in my six step. She is considerably shorter than me, and pointed this out by suggesting that I bend my knees to condense myself and better control my center of gravity, and to work in a fluid circle and not take each step linearly. Watching her demonstrate, I couldn’t help but think of strategy. One particularly established strategical framework is one in which the center is controlled while the outside is fluid and chaotic. By “established” I mean it hails from the days of Ancient warfare with generals like Brasidas and Xenophon. 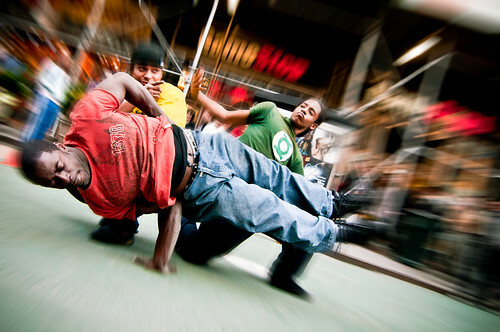 To understand the breakdancing example, you really must see a six-step, but the idea can translate to anything. Think of a tree, with its strong trunk and loose leaves. Or water rapids, fluid as a whole while individual waves are chaotic and unpredictable. Now apply this to your own life. Your personality becomes one fluid and controlled projection, while your actions may be outrageous and over-the-top; as long as a sense of awareness and endgame is constantly present, you needn’t worry about looking out-of-place or awkward. Or throughout the course of a seduction: randomly mix hints of attraction with coyness, while always retaining a cool air of detachment so as not to seem needy or dependent, two of the most unattractive qualities in existence. The flexibility and ubiquity of this strategy never ceases to amaze me. It can even be adapted to debating and directing conversations or presentations. It can certainly be applied to everything from storytelling to dancing to martial arts. I believe this to be the single most important strategy I have ever come across. This entry was posted in Essays and tagged breakdancing, strategy, xenophon on 2010.10.15 by Ben Sima.